This morning the Papua New Guinea Olympic Committee through its Olympic Values Education Programme and Athletes Commission, in partnership with the NRL PNG’s ‘League Bilong Laif’ and Cricket PNG’s ‘Kriket Blo Olgeta’ commemorated the International Day of Sports for Development and Peace (IDSDP) as well as the World Health Day with students from the Tokarara Primary School in Port Moresby. The date for the IDSDP is April 6 and World Health Day is on April 7. The joint session ran today reinforced the usefulness of sport in advocating for important human development and social issues. The students played rugby league and cricket games and picked up some health tips from presenters as well. Mark Mom from the NRL PNG said the aim of marking the day with these activities was to share the message to the students to stay healthy, and also to stay healthy playing sport. “Healthy minds, respectful behaviour, being respectful to others, these are really important things for Papua New Guinean people so we want them all growing up to be really strong, healthy and respectful Papua New Guineans,” Mom said. “We are happy to be doing this with Cricket PNG and the PNG Olympic Committee, we are really happy that we can get together and provide a positive experience for the grade three and four students of Tokarara Primary School. “They are working really hard in school and we are grateful to the school to allow their students to celebrate the day with us,” he said. With this year’s health theme targeting diabetes, presentations were made on the types of food and behaviour that contribute to avoiding it. Tokara Primary student, Wendy in grade four said she loves watching the NRL and hopes to play rugby league in the future. “I learned to pass the ball and play with my team mates to score tries. “I also learned not to eat greasy and oily food that can cause sickness like diabetes,” she said. Some of Papua New Guinea’s former and current athletes joined the students in the activities and urged them to be disciplined and work hard in school. “You must eat good food from the garden and markets and stay from sweets and soft drinks,” said PNG Powerlifter, Linda Pulsan. Former PNG Barramundis captain, Chris Amini said diabetes is a lifestyle disease, which is a major concern in Papua New Guinea and it was important to get the message to children while they are very young. “This is the best way we can spread this sort of message, by educating our children and they can take it with them when they go home and share it with their families and friends in their communities and pass on this message to beat this disease,” Amini said. “Everyone should know about this disease and eating the right food by avoiding fatty foods and soft drinks, is a great start to fighting and avoiding it,” he said. “Also to become an elite athlete, nutrition plays a big part in how you play and perform in your sport. 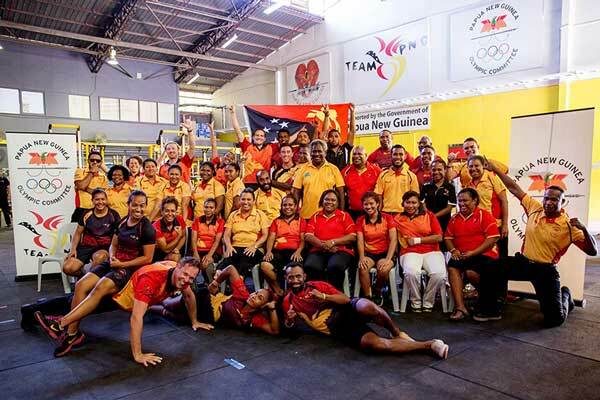 So, we wanted to remind these children that if they wanted to represent Papua New Guinea in Rugby League, Cricket or any other sport in the future, staying healthy and consuming healthy food and drinks is a very important.” Amini said. PNGOC Programme Coordinator, Shareena Tanabi thanked the NRL League Bilong Laif and Cricket PNG’s Kriket Blo Olgeta for partnering in the session to mark the days and also congratulated the students for being part of the celebrations. She said sport carries a lot of important messages and a healthy lifestyle is one of them. “It is important for children to learn about living healthy lives and sports is a great way of getting this message to them. “These kids are the future of our country and to have a strong nation, we need healthy people and healthy leaders running it,” Tanabi said.